Well fighting fans, this game makes you both happy and hungry for blood! With it's humor and style, it'll leave any player impressed by just the site of this game playing on the TV or at the arcade! 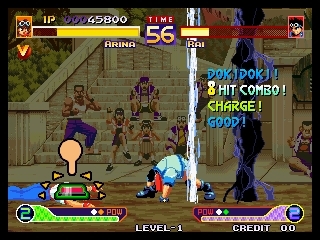 No other Neo Geo fighting game gives you the kind of enjoyment experienced from this game. 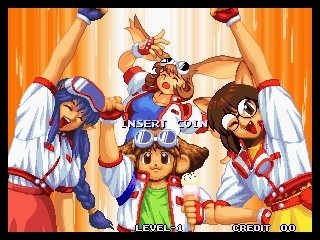 I think by now everyone should have figured out that this is one of my most loved games in my Neo Geo library. This game has very smoothly animated characters, which shine with its Manga style of presentation. And the graphics, some of the best I have seen on the Neo in fact! All the movements are details and quite fluid, all of the sprites are very well drawn. There are only 9 playable characters in VS mode, too few, and I wholeheartedly agree. Of course it would have been even better to have more but it does not matter because everyone can find their favorite character and learn the moves. And this does not affect my opinion in any way! All of the characters present in the game are fun to play and just as entertaining to master, unlike many other fighting games where there are always characters no one plays! Characters like Politank-Z and Mauru are REALLY original. Politank-Z is a robot built and used by the Japanese Police Force and is operated by dogs?!?! A very fun to play character, with many sneaky moves, like toxic exhaust farts, grenade tossing, and long arm and leg kicks like Dalhsim from Street Fighter II. The whole character shows the Neo's true power in handling the large 2D sprites, which brings a tear to my eye. Mauru is a big rabbit like animal that a lost 6 year old schoolgirl meets. Mauru is assisting her in the search for her parents. She sits on Maurus back and whispers what they must do for crushing their opponents. That type of character often fails to be a good fighter in many fighting games, but that is not true in the case of this Neo fighter, which makes it one of a kind! And lets not forget the last boss Fernandez. He is a REALLY big character. He takes up half of the screen and he looks like a huge bowling ball with eyes.... No comments on this guy! Absolutely the best I have heard! The crisp and clear sound that the Neo provides gives Arinas' stage a whole song! A Japanese girl is singing with a light voice, a 'happyday' pop song. Very cool!!! Although, I have no clue what she sings, my Japanese is not too good. Also, Mauru's stage has a cool track. The music has a drum 'n bass style and reminds me a little of artists like Squarepusher and Aphex Twin, if anyone knows who they are. And, I must not forget Slash's stage where a crisp and clear violin plays a cryptic melody. Very good music! This game has VERY tight control. It reminds me of some of the Street Fighter games. The characters respond on all of the special moves very quickly. They are just wonderful to control!. Special moves can be activated when the power meter is filled and a 'POW' light is lit up. You can have up to 7 POW lights lit up, which gives you a chance to make the special moves bigger, or also the chance to make many moves in a row! Everyone has one unique super special move. A 'WARNING' sign will appear on the screen, showing that something really bad (or really cool!) is about to happen. When they are executed, the camera sometimes will zoom out to make sure that all of the action will be onscreen! Almost half of the victims energy will be lost from this attack. However, the super special attack takes some time to make, so watch out for your opponent's counter attack! This attack is best executed when you are a good distance away from your opponent! The characters can also run and kick. This makes the fight somewhat more intense. For example, your opponent kicks you in the stomach and you fly from one side of the screen to the other side! (Yes, a very sneaky and harmful move!) Then, from there you can rush back at him and strike! Also, as in Street Fighter, you can bounce off the wall and jump over your opponent. A very good option when you are cornered! 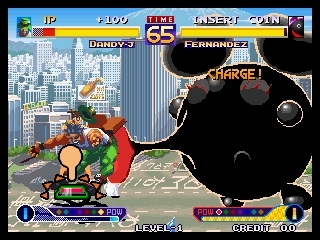 This game was made in 1996, its 259 megs in size, and it is a very strong game compared with the other big Neo fighters like the games from the KOF series and the FF series. Even when you get sick of playing this game, you can pick it up a week later and have a blast AGAIN! It will still be a great game years from now, a classic maybe? People will say they wanted more characters or better backgrounds, but that does not matter. For me it is a one of a kind game., one I will NEVER sell. I probably will pick it up when I'm 40 and still enjoy it as much as I enjoy it now. The game contains tons of humor and with its very happy mood, its an everlasting hit on Saturday nights with the friends!